You have the following items saved to your itinerary. Click on an item for more information or click the orange ‘X’ to remove. We’re back in the off again-on again rainy season here in the Pacific Northwest, but that shouldn’t stop you from having fun. There are plenty of fun indoor activities in Seattle Southside for families and travelers. One attraction near you that sits right near the top of the list is the largest private air and space museum in the world, The Museum of Flight. Have you been to The Museum of Flight? If so, when was the last time you visited? The museum is constantly changing as new exhibits, planes, and artifacts switch out frequently. Destination Moon explores the early days of American spaceflight and the Apollo 11 missions to the moon. Vietnam Divided: War Above Southeast Asia reflects on the airman&apos;s experience during the Vietnam War. If you haven&apos;t been to the museum in a few years, you&apos;re going to be blown away by the Aviation Pavilion. Housing an original Air Force One, a Boeing 787 Dreamliner, the Concorde, a B-17 “Flying Fortress,” and many other historic aircraft. This sprawling, 3-acre complex resembles an air hangar which spans several decades of American aviation innovation. My favorite plane in this exhibit is the B-29 “Superfortress” which after years of restoration, is finally available for public viewing. Back inside the museum, you’ll find plenty of air and spacecraft, as well as interactive, kid-friendly exhibits. The flight simulators, 3D movie theater, and cockpit experiences make the museum feel more like a theme park for kids. Before you go, make sure to stop by the gift shop for plenty of aviation/space themed toys, books, models, apparel, and more! Lastly, here’s an insider tip…don’t leave the museum without exploring the Personal Courage Wing to check out WWII and WWI fighter planes. It’s my personal favorite exhibit and I can’t recommend it enough. When you walk through the gateway and into the dimly lit WWII gallery, you’ll feel like you’ve stepped back into another time. Not to mention, with Pearl Harbor Day fast approaching, it makes for an awe-inspiring, educational experience for the whole family. 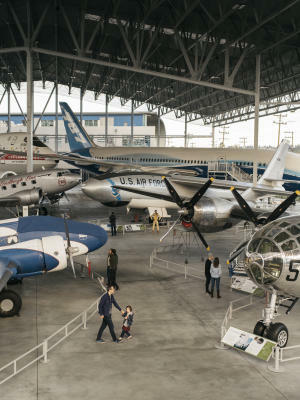 Whether it’s raining or not, The Museum of Flight is a must-see attraction in Seattle Southside. Take the kids (or the parents) out for a day at the museum, and have fun!